We offer age specific classes for 3, 4 and 5 year olds. We do not combine these ages. The learning curve, attention span and development abilities of these ages are quite different. We adjust our teaching methods and material for each child at their stage of development. * Pre-School 1 and 2 perform one number in our annual recital. * Kindergarten dancers perform two numbers. 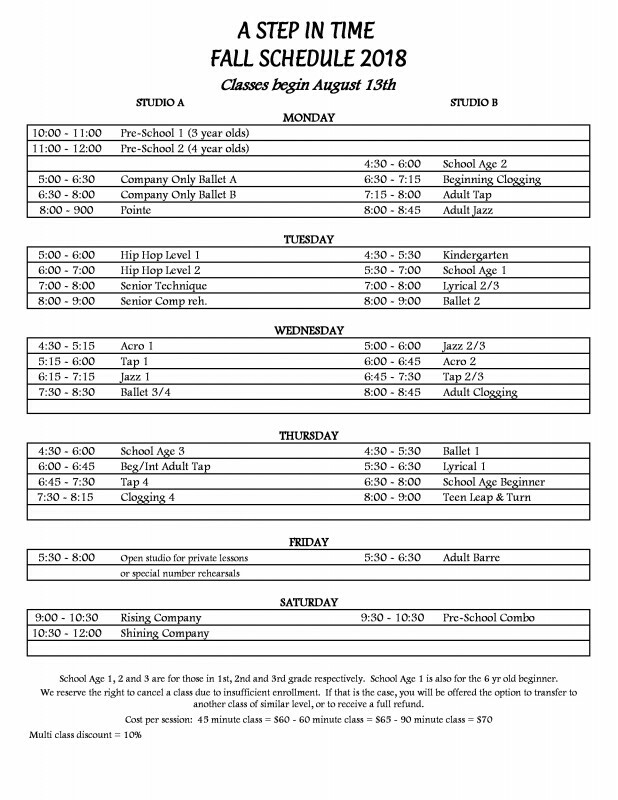 These are 90 minute classes that include ballet, tap and jazz technique. These ages are variable depending on experience and ability but serve as a useful guideline. School Age 1 is for the 6-7 year old beginner or the student who has been enrolled in our Kinder class in the fall and is at least 6. School Age 3 is for the 8 year old with previous experience. School Age Beginner is for the older beginner age 9 to 11. This class is an introduction to ballet, tap and jazz and is taught at a faster pace than School Age 1. A 6 or 7 year old beginner should take School-Age 1. These ages should be used as a guide based on our syllabus. *Please note: all level 4 class placement is by audition only.